Found on Brighton: Welcome April! I absolutely love the month of April! I love how Spring creeps in bit-by-bit each day. It is a month of growth, full of color and change. And the birds return! Another reason I'm excited about April is it is the first month we are having a theme in the Everyday Journals group. 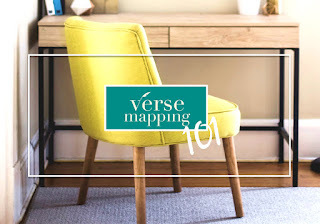 Our theme this month is VERSE MAPPING. 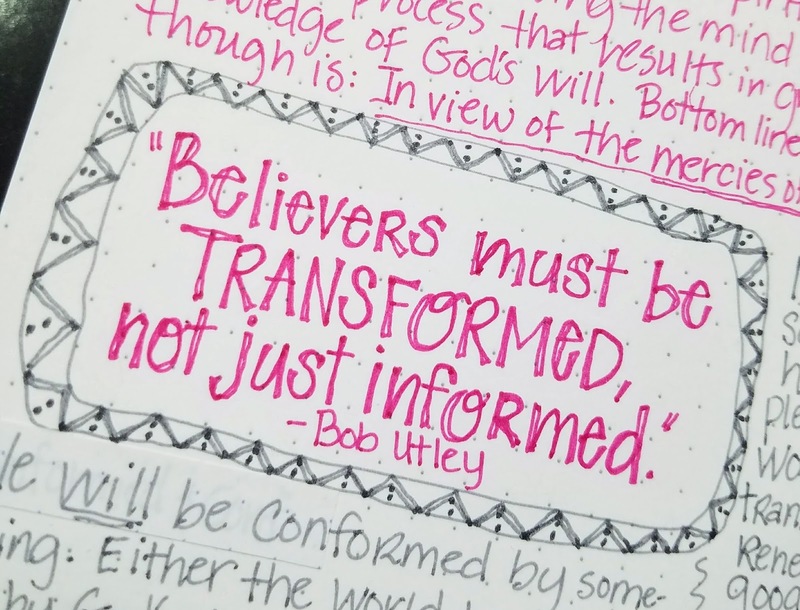 Any time I get a chance to combine Bible study and creativity (plus colored markers) I am a happy camper! Last week Bernice posted The Message version of Romans 12:1-2. That passage resonated with me for a few reasons. 1. 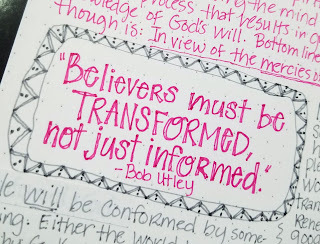 I had just studied that passage in the Women's Bible study on spiritual formation that I recently co-led. 2. I have wanted to study the book of Romans for a long time but as I go along other things get in the way. I had already decided to start that Romans study in April and no matter how long it takes I'm going to get through this book. And I'm going to record my progress here so you all can keep me accountable. During the month of April I am going to try a number of verse mapping methods I have found online. As is my nature, I will probably add my own twist to these methods and eventually end up with a method that combines a few along with my style. I then followed the steps provided by Kristy Cambron in the link above. 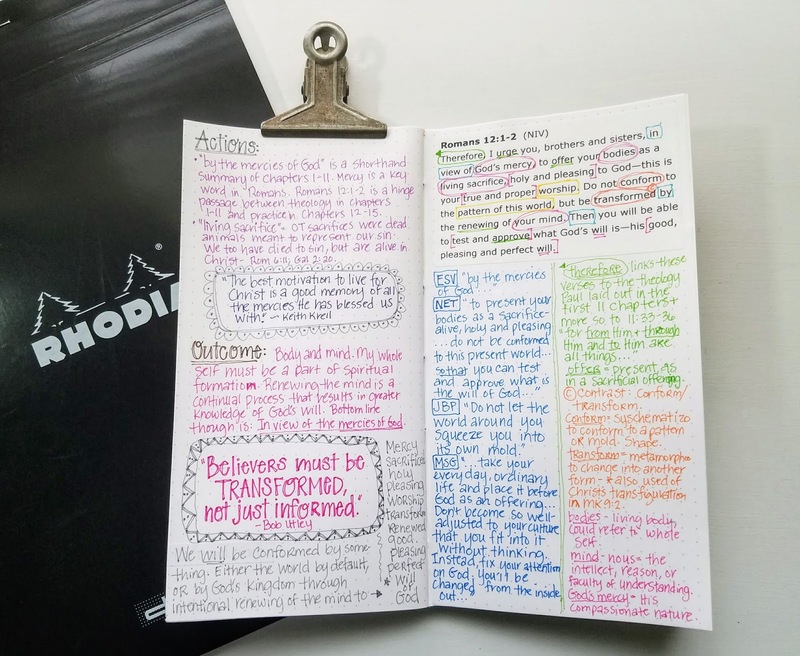 I really like using Rhodia Dot paper, so I cut some down to fit into my Everyday Journal, which is a standard size Traveler's Notebook. Rather than write out the verse I printed it in order to fit it onto my page better. I marked key connectives, terms I felt were significant, contrasts, verbs, etc. on the printed passage. I then copied some parts from other translations that I felt expanded the meaning. I then wrote out some study notes about some of the words and the contrasting terms. 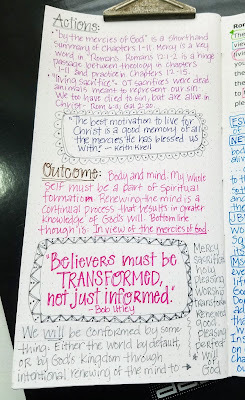 On the opposite page I used Kristy Cambron's Actions and Outcome sections. Under actions I wrote down some of the significant things I learned, along with a quote I found while studying. Under Outcome I made some notes gleaned from this study that I felt were personally significant. Plus another quote found while studying. Overall I enjoyed Kristy Cambron's method. I use colored pens when I do inductive study so adding the notes in color helped me correspond them with my markings of the passage. Plus using colored pens helped me feel like I was being creative while studying, and that I really liked! I also enjoyed adding the quotes. I love quotes and adding them into my verse mapping will help me remember them when I look back at these notes. 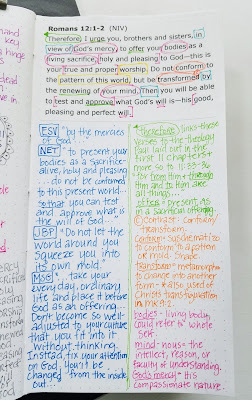 What you can't tell from looking at my photos is that when I glued my verse map pages into my Everyday Journal I didn't check first and glued them in upside down! Oh well, mistakes keep me humble! 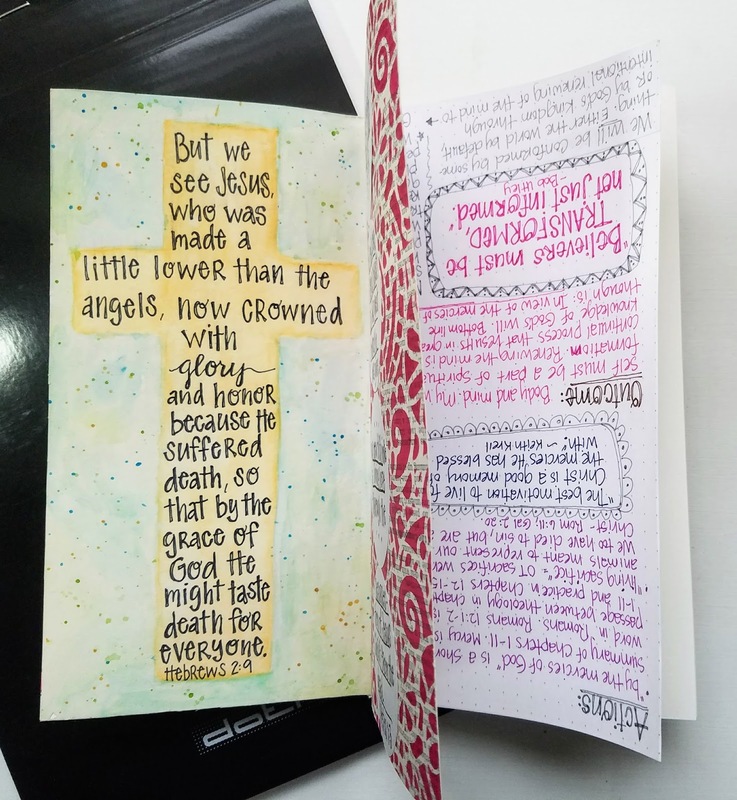 We have just one rule in the Everyday Journals group which goes for our Verse Mapping theme as well: There really are no rules. We are each doing our journals in a different manner, using different types of journals. 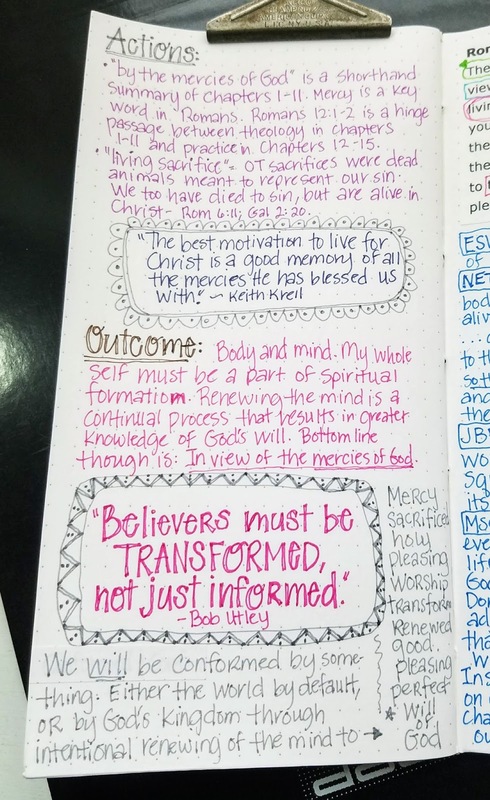 What makes them Everyday Journals is not that we do something in them every day, but rather, that we are using one journal for all of our everyday life things and combining those things with our word for the year. So as you participate with us know this: you do not have to do things in the way that Valerie, Bernice or I do them. Feel the freedom to add your own twist and style! Watch for more examples of verse mapping on all three of our blogs throughout the month. 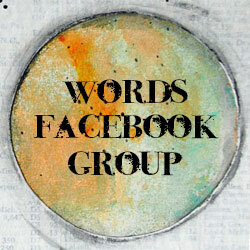 Share what you do in the Facebook group. I'm loving these Sharpie Art Pens! They don't bleed through the paper, even in my Bible. There are 24 wonderful colors too.